Spring has arrived! 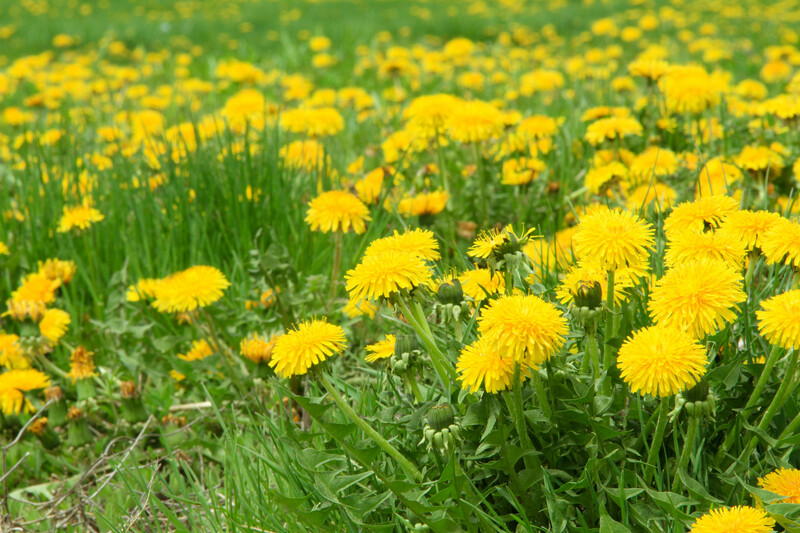 Well, at least the dandelions have. I know they are weeds and not necessarily desirable in the front lawns of suburbia, but how can you not smile looking at a sea of beautiful yellow and green? We came upon this vacant lot near the theater where Mr. N performed his five shows this past weekend and it just made me smile. Speaking of smiles, today is our last recipe inspired by the “Land of Smiles,” Thailand. This recipe came from a good friend of mine and isn’t an authentic Thai dish, but definitely Thai-inspired. The kids and I were up north visiting my good friend and her kids (leaving Mike to his NCAA tournies) and she prepared this dish for our arrival. We hadn’t yet officially started our cooking adventures in Thailand, but I knew this would have to make it to the blog. 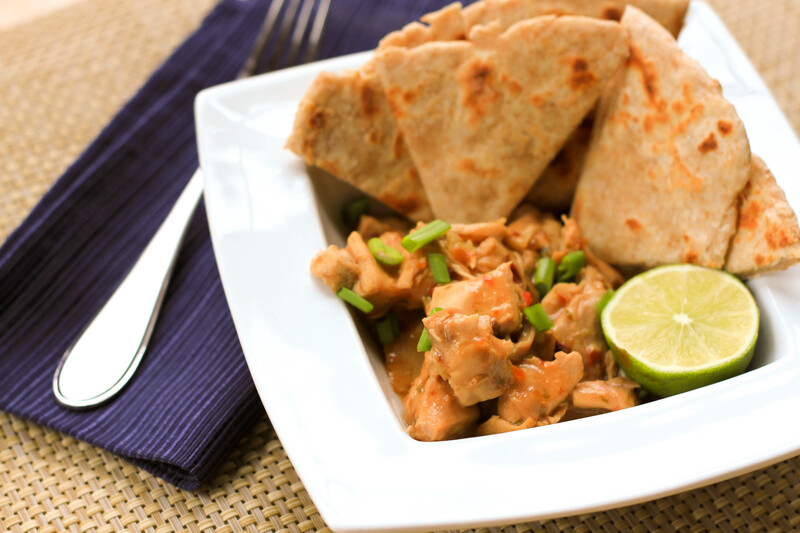 So today we bring you Slow Cooker Spicy Peanut Thai Chicken. The ease of this dish certainly makes me smile! 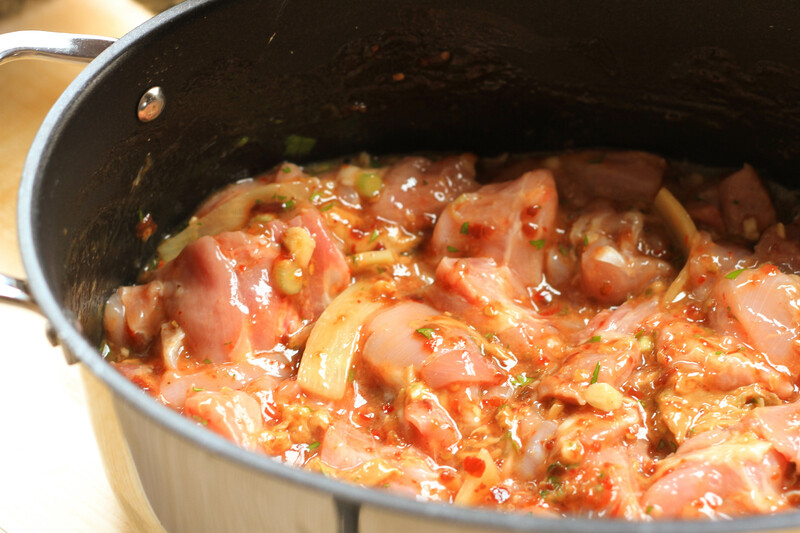 The recipe is simple, mix together peanut butter, lime juice, soy sauce, freshly minced ginger, sweet chili sauce and sambal oelek (ground chili paste). While not really an authentic Thai dish, this inspired version has helped feed us and keep us sane during these busy weeks. And Miss A and I have enjoyed whipping up a very easy (again non-traditional) naan to go with the chicken. 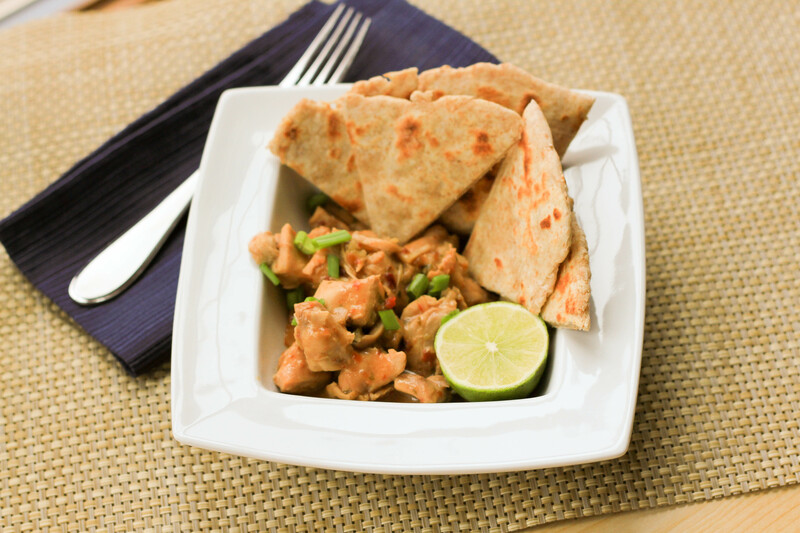 While you could also use rice, naan is a fabulous complement to the meal. 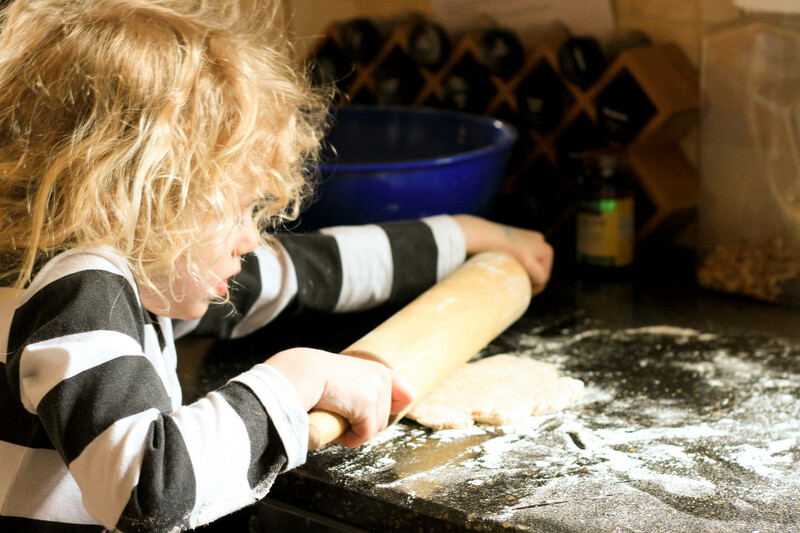 We typically mix the dough in the morning, let it rest in the fridge for the day. Then we roll it out and cook it up in 15 minutes before dinner. Can you see why the Land of Smiles has us smiling?! But the smiles don’t end there. This meal gets high marks from all of us! When the naan was complete and the chicken cooked through, we garnished the dish with fresh cilantro and toasted peanuts. Mike, Mr. N and I all really like this dish. It’s one we’ll make again and again. Partly for its simplicity and partly for its flavors. It’s a great weeknight flavor punch – spicy, sweet and those little crunchy bites of peanuts – yum! This easily earns 3 spoons from each of us. Thank you for the recipe Missy! Now before we sign-off for today and end our Thailand cooking adventures, Mr. N wanted to share one last fact about the Land of Smiles with you all. Did you know that Bangkok’s Thai name is the longest place name in the world? The Thai’s call Bangkok, Krung Thep, but its official name is Krung Thep Mahanakhon Amon Rattanakosin Mahinthara Yuthaya Mahadilok Phop Noppharat Ratchathani Burirom Udomratchaniwet Mahasathan Amon Phiman Awatan Sathit Sakkathattiya Witsanukam Prasit. Whew!!! There is a bit of controversy surrounding the validity of the statement as North Wales and New Zealand also lay claim to the title, but you can read more on that here. While I can’t claim to know the true title holder, I do know this is a LONG name! And I know there is one thing I wish could last longer…childhood. Mr. N was in his first “real” play this past weekend. 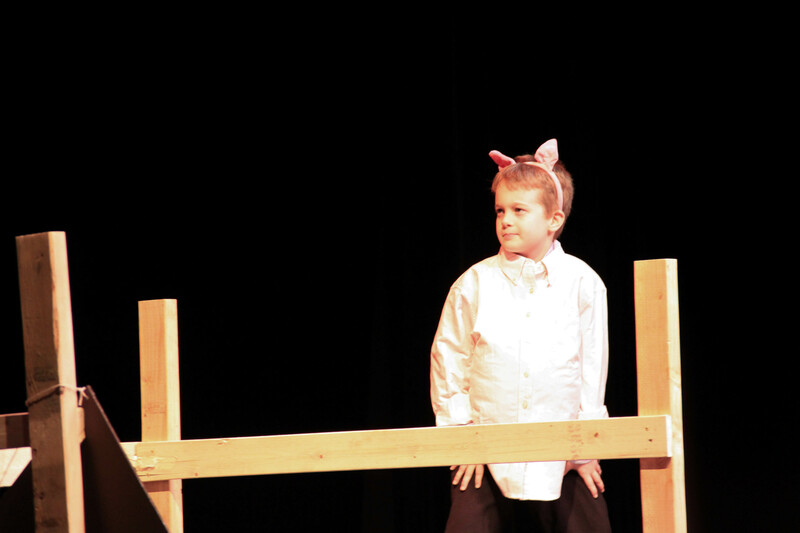 This wasn’t a camp play or school play, but one at a community theater for which he auditioned and rehearsed for months. In fact, he even got to miss two days of school to perform for other schools’ field trips. To say he was proud and excited is an understatement. He was an ensemble character in “Charlotte’s Web” in a cast of about 25 other kids aged 1st grade through high school. He made friends, had a few crushes (shhh!) and even had his first kiss. Well, sort of – he was kissed by a younger girl and quite mortified by it! In fact, he told Mike that when he becomes a famous actor someday he’s going to have to get married really fast because he can just imagine how many girls chase famous actors trying to kiss them. So his solution – he’ll need to get married quickly. Oh boy…I think I’m getting some gray hair now. Truthfully as a parent, watching him become part of a group – part of something outside of home, outside of school and larger than himself was a proud moment for Mike and I. 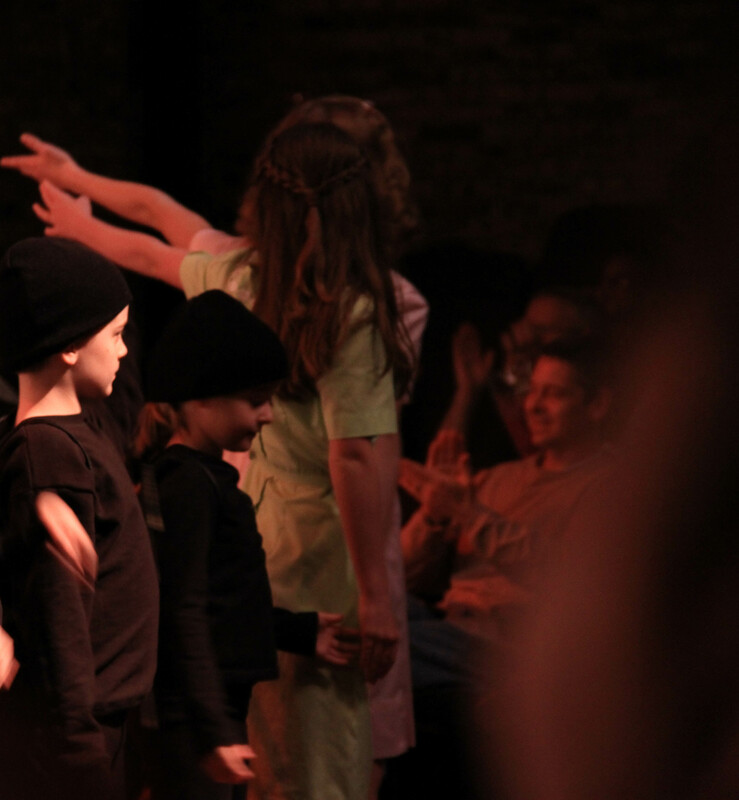 Sometimes we have a hard time believing he’s only almost 9 when we see him reassuring other cast mates that there’s nothing to be nervous about – that this is exciting, and congratulating and hugging his other cast mates at the end of the production. Then other times we think, my goodness how is he almost 9?! Watching him perform his lines, projecting his voice, getting laughter and applause, I couldn’t help but think, “That’s the little 3 pound baby I held in my arms not that long ago.” Sigh. I think it might be time for a life saver (a tasty dessert from Geni who knows all too well how fast children grow up!). Thank goodness for cameras, so we can preserve these little, and oh so brief, moments of childhood. I just found your blog while visiting another blog. All your recipes looks really good. I will subscribe. Seriously, Mr. N looks like he’s going to be an actor in the future! He is great looking and so talented!! It must must have been a great experience for him and it also must have been a proud parent moment – congratulations! 🙂 Homemade naan and Thai chicken look really good! I need to slowly introduce more spice to the kids. First of all -the pics of the play are adorable. What a cutie! 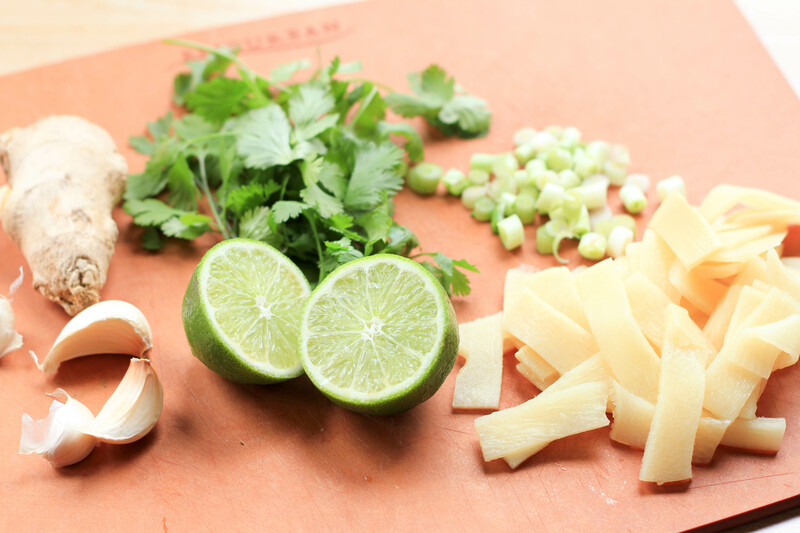 And this dish sounds amazing – I’ve been totally into Thai flavors lately and I know I’d love this! 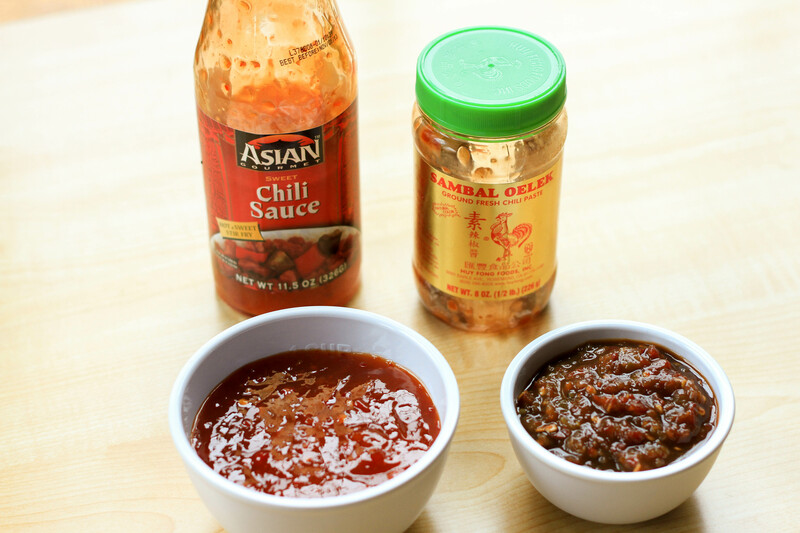 Oh where to start…the easy spicey thai dish …the first kiss or the lovely Miss A dancing in a field of dandelions! 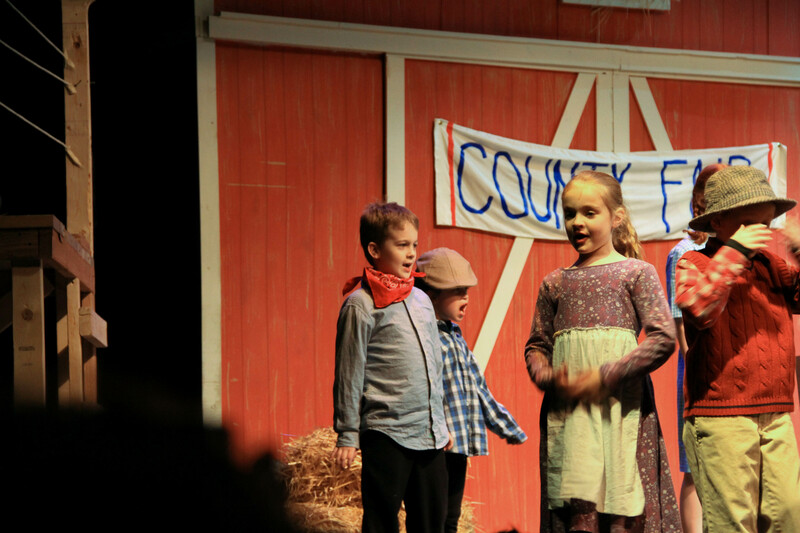 If only we could have gone to this performance of Charlotte’s Web — the girls would have loved it! Congrats to Mr. N on his first big production! I love how easy this dish sounds Kristy…I’m just wondering if the ponytails would be in Miss A’s camp on the spiciness??? Mr. N is a PRO! No joke! Look at him… such a natural. Bravo!! the chicken looks and sounds delish! I always cry my eyes out at my kids plays and concerts!!! My oldest is graduating high school this June!!!! I’ll be a basket case! Oh, I can’t even think about them graduating high school. I know it will be here all too soon too! Congrats Mary! Ah, like a pulled chicken, yum!! Well I have to say this dish was a huge hit Kristy! We all enjoyed the warming taste and incredible flavors. The crunchy peanuts and sprinkling of cilantro on top was the perfect finishing touch. I have a feeling this may well become a new family classic and does this mom ever appreciate slow cooker meals (I don’t care what time of year!) thanks so much for the recipe. Just made it again! (I warned you it was good enough to become a classic ;-)). I am only a train ride away from Broadway, so please let me know when Mr. N comes to NYC. Yes, kids grow up so fast. My 2 have their own homes but I still refer to them as my kids. I know what you mean – I still call mine my babies and they just roll their eyes at me, “Mom, we’re not babies anymore.” Oh, but they are to me! Oh stop it Kristy, you were totally crying :). So now we have an incredible actor and fashion designer on our hands. Life is about to get interesting :). And if he decides to come to Broadway and get married fast, just remember I’M IN NYC honey :). I will be ALL OVER that situation LOL. Watching them grow up, and still growing, has been a pleasure. I adore those two and you and Mike should definitely pat yourselves on the back :).. before the teenage years come around :). I adore you guys. LOL! Love it Kay! And believe me, I’m trying to block those teenage years from my mind (Mr. N is almost only 4 years away – gasp!). Super blog; I’ve nominated you for the Super Sweet Blogger Award. 🙂 Keep doing the great work. I would say that it would be most convenient. 🙂 I sure hope they stick around…then again, I won’t be one to hold them back. They just better visit! What a brave young man our Mr N is – actually before going any further, may I please ask for his autograph now, before he is world famous and quickly getting married – not sure he will have time later on. 😀 How wonderful to have such a beautiful family. 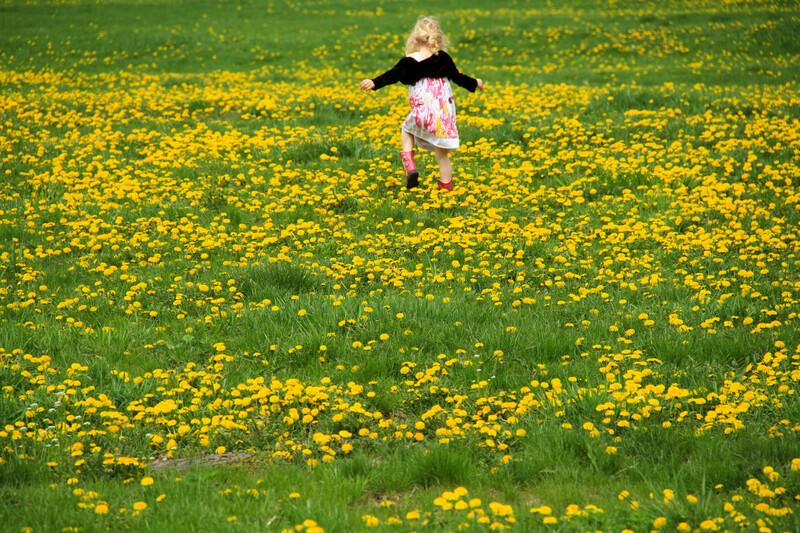 I love the pic of Miss a running through the dandelions, which I have on good authority are good for bees. 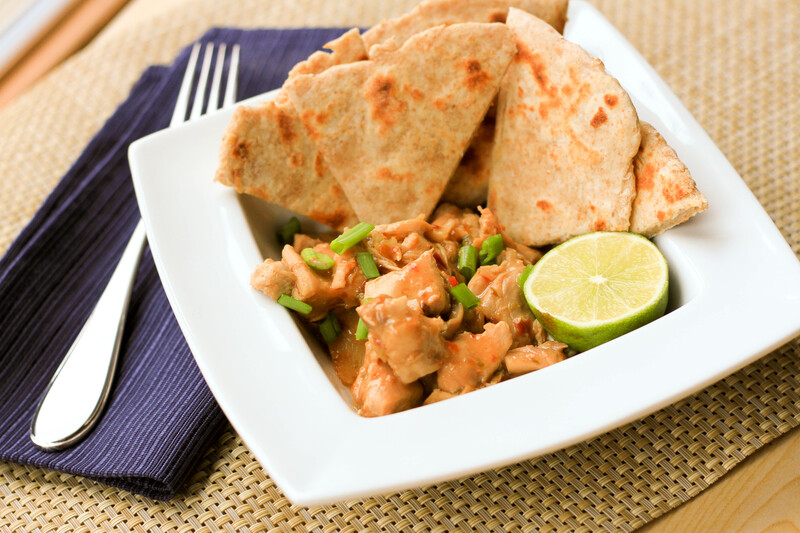 I’m not mad about peanut butter in food – something about being hot doesn’t quite work, although your dish sounds superb and homemade naan is so nice. LOL! I have no doubt he would gladly send you his autograph Mandy! 🙂 I’m usually not a huge peanut butter fan either, but the funny thing is, I actually prefer it warmed and melty to straight out of the jar. I wonder how this would taste without it…I’ll have to experiment. Count me in for one of those life savers! Third grade ends in just three weeks and this year had been a really busy one, the amount of “maturing” they do in a year, in a month and sometimes in a couple of weeks! You see them grow and wish so hard you could slow time down! only if! Isn’t it amazing Sawsan! Third grade was such a big year for Mr. N. He’s so different today than he was 9 months ago. It’s incredible. At the start of the year his teacher said as much. She told us third grade goes by VERY fast and they grow up tremendously. She was right on both counts! I know Mr. N and Alfie would get along so well together. The seem so similar – acting, swimming, etc. And my goodness, I have no doubt that Miss A would practically idolize Arabella! What a great post – and how exciting about the play!! Looks like he did a fantastic job – as for the chicken, looks delicious!!! Oh, I do know so well how they grow up too fast. It does seem like only yesterday we were holding them in the hospital. 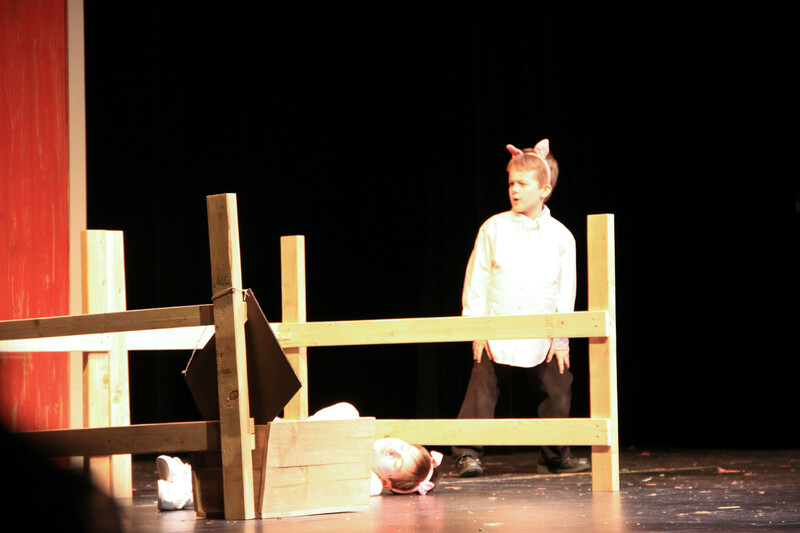 I love the photos…the play looks like so much fun and Mr. N. should be very proud. Working that hard and reaping the benefits is so rewarding and such a good lesson in general. Most great things only come with hard work. 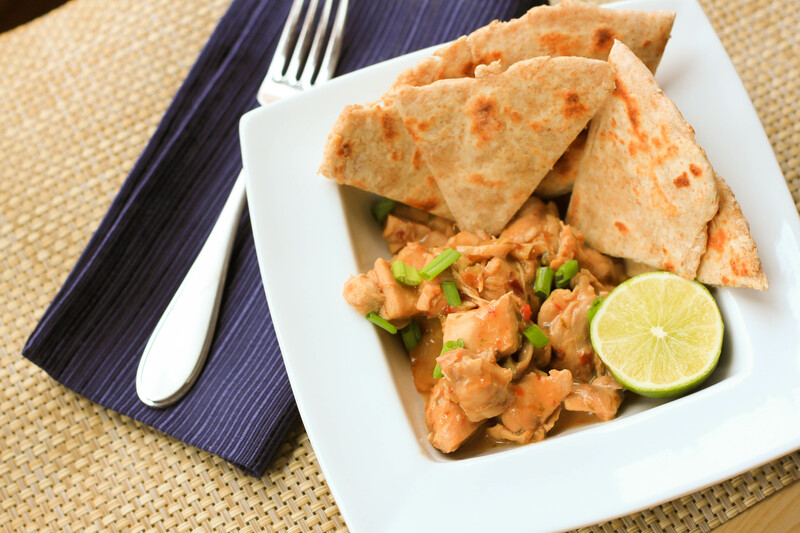 And this slow cooker chicken dish looks incredible and your naan. YAY. This a fantastic post Kristy great stories as always and delectable dishes. Thanks for the mention and have a great week. For us it’s only 2.5 weeks of school left before I have a college “man”. YIKES!!! More life savers all around. Indeed – lots of lifesavers. 🙂 I’ll be thinking of you! Tears? It’s just my lunch, has these spices from Persian cooking… gets me every single time!